This is only its second year but already Paris-Tableau has apparently become a permanent fixture on the international art market. If we add the exhibitions found outside the show which we will cover in an upcoming news item, this makes Paris, now the drawing capital of the world in spring, the leading figure in old master offerings. 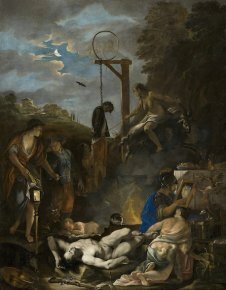 Regretfully, except for Artcurial which presented notably a charming small copper work by Boucher (The Holy Family) and which was quickly sold (on 7 November), no other specialized auction was organized for the occasion. Visitors to this temporary museum staged at the Bourse in Paris will not be disappointed. 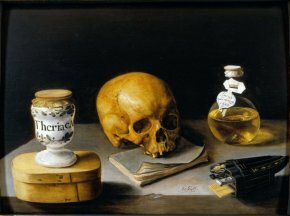 After providing remarkable offerings already in 2011, the show is even more impressive this year, although foreign galleries still prefer, it would seem, to keep certain works for Maastricht. 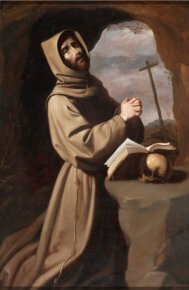 This in no way prevented the Galerie Caylus, Madrid, from presenting a splendid Saint Francis by Francisco Zurbarán (ill. 1) among other beautiful Spanish and Italian paintings. At Charles Beddington’s, besides a beautiful ensemble by Pietro Bellotti, the brother of Bernardo Bellotto, also an assiduous traveler who came notably to France, there is a Lemaire-Poussin, unusually large in size (ill. 2), while if remaining in the French 17th century, we would point out the still-life by Sébastien Stoskoff (ill. 3), another masterpiece, at the Koetser Gallery. 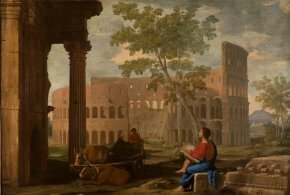 The Italian gallery, Fabio Massimo Megna, a new arrival at the show, is presenting a beautiful selection of canvases including an anonymous Siennese work from the 17th century (ill. 4). The stands of Parisian dealers are of very high quality and the French 17th century particularly well represented, notably at the Coatalem and Leegenhoek galleries. 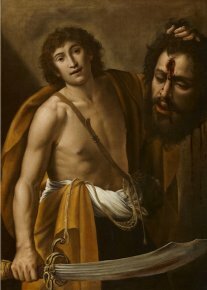 The first is showing a impressive series of paintings by Jacques Stella and an unpublished Crucifixion by Lubin Baugin, an artist particularly dear to this dealer. 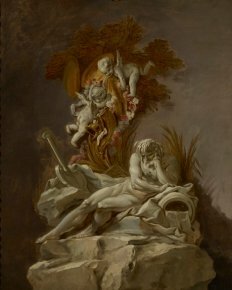 However, we reproduce an 18th century work, a grisaille by François Boucher, one of a pair representing Rivers (ill. 5). 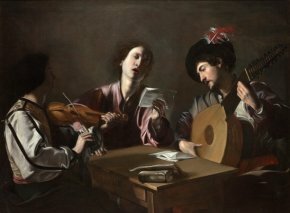 The second gallery is offering, among other very interesting works (including a painting by a certain Guillaume Dumée which will no doubt elicit other reattributions to this artist), four Caravaggesques. Of these, we point out here the one by Nicolas Tournier, sold (like the Baugin and a Stella) on opening night (ill. 6). At the Talabardon & Gautier stand, visitors will see some magnificent, as usual, 19th century paintings, now their specialty (the portrait of Carolus-Duran, which they exhibited at their gallery, is enhanced even further here by the gray backround). 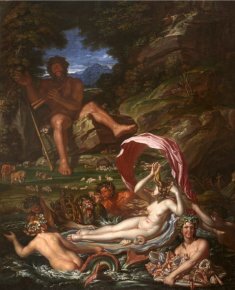 However, we know they can also reach further back in time and now are also showing a surprising painting by the Swiss artist, Joseph Werner representing Acis and Polyphemus (ill. 7) with its acid colors and in a magnificient state of conservation. This native of Bern traveled through France and worked at the court of Louis XIV (several of his works reside at Versailles). He underwent various influences but this canvas reveals a Utrecht Mannerist vein close to Wtaewel. 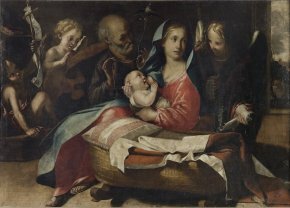 While visitors will be sure to notice a 17th century painting at Bob Haboldt’s, we would on the contrary choose rather a 19th century canvas by an almost unknown artist with such a fascinating composition that makes it hard to ignore (ill. 8). 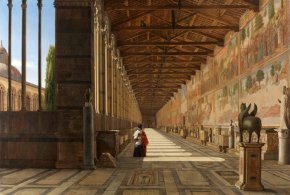 Painted in 1834 by Antoine-Marie Perrot - who the Bellier Auvray dictionary tells us was a student of Watelet and Michallon, exhibiting at the Salon between 1824 and 1849 -, it represents a gallery in the Campo Santo in Pisa with a dizzying perspective. The pronounced depth seems to pull the spectator straight into the painting. Our visit continues (with no chronological or spatial order, which is after all of no consequence) with the Galerie Canesso where we would mention another very Caravaggesque canvas, David and Goliath (ill. 9), moving on to Didier Aaron’s to look at a study by Carle van Loo for a chapel at the Invalides and which will be joining an important Parisian collection (ill. 10), then stopping at Claude Vittet’s with a display cabinet holding some very fine gouaches representing battles by Nicolas van Blarenberghe (ill. 11) and one by his son, Henri-Joseph. At Jean-François Heim’s we would like to point out a very beautiful portrait of an African slave by Jean-Léon Gérôme and a modello by Pierre Mignard for the Hôtel Hervart in Paris but we prefer to reproduce an original Scene of Witchcraft by the little-known van Wijnen (ill. 12). The Weiss Gallery stand, which we were glad to see again after its mishap last year with the Nicolas Tournier painting, is showing Northern European and Elizabethan portraits, the latter now the specialty of this British dealer, while at Lampronti’s visitors will essentially find vedute and at P. de Boer’s Still-Lifes (including a delicate Jacques Linard). As we wish to leave no one out, we will conclude by mentioning the Galerie de Jonckheere with a Portrait of the Duc d’Etampes by Corneille de Lyon, Stair Sainty with a very beautiful Roman landscape by Henri Harpignie, Derek Jones with an attractive Wtewael (Mars and Venus Surprised by Vulcan), the Sarti gallery which is showing, besides several Primitives, a Salvator Rosa representing Saint Peter Freed from Prison by the Angel, the Austrian gallery Sanct Lucas and its Flight into Egypt by Valerio Castello and Rafael Valls who is offering a canvas representing The Duc de Saint-Aignan Decorating Prince Vaini with the Order of the Holy Spirit by Pierre Subleyras. Last year, the INHA offered a short exhibition focusing on painting backs. This year, the Mobilier National is presenting some cartoons and studies for cartoons from its holdings. A small catalogue, Trésors retrouvés des Gobelins was especially edited for the occasion and is sold (for 12€) to fund their restoration. 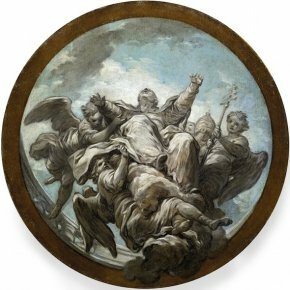 We particularly noticed a painting by Jean-Jacques Lagrenée, Allegory of Architecture, of Painting and of Science, a study for the series Arts and Sciences. 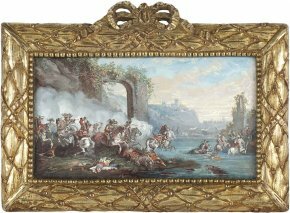 This purchase made at the first Paris-Tableau a year ago will be included in an upcoming article on recent acquisitions by the Mobilier National. We can already say that the Salon is a resounding success, as most of the dealers have sold several works and met many French and foreign clients. However, we should remark that when a date was chosen for the show, it was not supposed to fall during the school holidays. At the last minute, the new Minister of Education decided to extend the All Saint’s Holiday to the end of the week as of 2012 instead of waiting more wisely until next year. Attendance may thus be down slightly but Monday the 12th should be particularly eventful. Paris-Tableau, Palais de la Bourse, from 7 to 12 November 2010 Internet website.